The Izzo Swami Watch has been retired. Check out our current recommendations for today's best golf rangefinders.. Please Note: Izzo has released a new golf watch with the same name. Before I did my Izzo Swami Golf Watch Review, I wanted to read all the user reviews we could find to get a feel for what people liked and didn’t like. Accuracy and convenience were the most mentioned pros. I definitely agree that it seems as accurate as any golf GPS I’ve tried and the convenience of GPS in a watch, is ultimate! The size and bulkiness of this GPS watch, was the most mentioned con. I agree that the Swami Golf Watch is a little bulky, but even with my small wrist, I didn’t find that to be a problem. However, comfort was an issue for me and my small wrist, although not for everyone. Several users specifically mentioned that it was comfortable. It’s also probably important to mention that I don’t normally wear a watch. 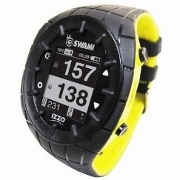 My overall opinion is that the Izzo Swami Golf Watch is an outstanding value. It’s easy to use, convenient and accurate. I would recommend it to anyone with a medium to large wrist or to anyone who wants to fasten it to their golf bag. That’s what I did and found that to be extremely convenient. I wear a +1.5 in reading glasses and could see the watch clearly without I figure I’ll be okay until my eyes need 2.25. In full disclosure, Izzo did send me this watch to use for a video review and to offer as a giveaway to one of my readers. I stand by my opinions and summaries of reader reviews. Size (Width x Height x Depth) N/A in. x N/A in. x N/A in. GolfRangefinderShop.com is a participant in the Amazon Services LLC Associates Program. If you buy anything after clicking through, we get a small commission at no extra cost to you. It helps us keep the site up and running, so thank you! We work very hard to obtain the correct information about product features, but cannot make any guarantees about the accuracy. Please double check with the merchant or manufacturer before making a purchase. In May I purchased and used an Izzo Swami 3000. It kept shutting down everytime it received the least bump or knock. I finally solved this by applying a layer of foam tape across the back of the unit. Still, it was awkward on the course aligning the unit with my ball, reading the distance and replacing the unit on my bag without jarring it at all. So, I purchased the Izzo watch. It is a bit large but it is not so large as to be cumbersome or interfering with my swing (of course, with my swing there are probably very few things that could cause anything but an improvement). The convenience of simply turning on the unit at the course and reading the distances is unbeatable. The ease and value of being able to accurately measure the actual distance of every shot on the course is exceptional! Finally, an easy and practical way to dial in every club in a real world experience! It took a bit of hit and miss to figure out how to use the score keeping feature but even tech impaired I eventually figured it out. One other issue I came across was that once I completed the round and left the area of the course I can’t refer back to the scorecard. I guess I’ll have to continue to rely on 19th century technology and carry a pencil and card. For the price, simplicity of use and the accuracy I haven’t seen anything close. Would I recommend this to my friends? Never! I don’t want any of them sharing this advantage on the course. They hardly let me play with them as it is, and I’m the guy that gets all of the tee times!!!!! J.R. Thanks for the review. All of the golf watches are pretty large, but the convenience of having your distance with you and available at a glance is hard to beat. Too bad about the scorecard feature. We’ll check with Izzo to see if there is a way to save it. I bought this watch a week ago and got to use it on thurs. golf league nite. I’ve always worn a watch and this one is so light I did’nt even notice it. The ease of use was nice…turned it on, it found where I was and because we play a shotgun start I hit the up arrow to the 6th hole and off we went. The accuracy is amazing, we had just hit a shot to about a yard of the hole which was a red flag and very close to the edge and my Izzo said we were 2 yrds from the hole and from where I was standing was spot on…very happy with this purchase. Got mine on e bay for just over a hundred bucks and free shipping.